Artificial intelligence is one of those technologies that can generate all sorts of fantasies for some and fears for others. Like many technologies, it is difficult for us to understand how it works and therefore the associated issues. The technological news reverberates us performances of IBM Watson , quadruple or biped robots of the subsidiary of Google, Boston Dynamics , or the last experiments of cars with automatic control , at Google or elsewhere. It’s easy to put all this in the same bag, under the name of artificial intelligence as if it were a very unified whole. It is not so ! Artificial intelligence is a whole piece of computing with its diversity, its technological bricks, assemblies and solutions of all kinds. It is a true eclectic ecosystem. What’s more, the vast majority of Artificial Intelligence business solutions are made of odds and ends, based on very specific needs. We are far from having generic AI solutions. This bioinformatics diversity is currently generating a sort of protection against the AI ​​threats mentioned by some Cassandra in the industry. These fear a fateful deadline where AI will take precedence over human intelligence. The famous astrophysicist Stephen Hawking did not hesitate in 2014 to prophesy that when the AI ​​will exceed the human intelligence, it will be the last human invention, this one then having entirely taken precedence over the human species! In his pessimistic version, he quotes a quote from Irwin John Good from 1965, published in Speculations Concerning the First Ultrainteligent Machine, according to which the ultra-intelligent machine will be the latest invention that man will need to create. Bill Joy had published ” Why the future does not need us“In 2000 in Wired, sounding the alarm about the dangers of technological advances in AI, nanotechnology and biotechnology. It was well before the end of the first full sequencing of the human genome that had cost a fortune. We also learn that he had met Jacques Attali and that the latter had indirectly influenced the course of events in Java! Bill Joy was actually scared of Ray Kurzweil’s insights he had met in a conference in 1998 and read his “The age of spiritual machines”, published six years before “The singularity is near”. Then a big decade of calm side alerts. Bill Gates and Elon Musk took up the torch of Bill Joy in 2015 to ask for a technological break and a reflection on the limits not to be exceeded with artificial intelligence as with robotics. 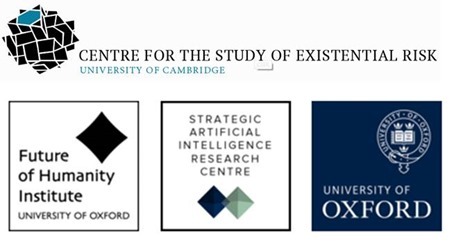 There are even research institutes working on this issue: theCambridge Center for Existential Risk and the Oxford Future of Humanity Institute . In the optimists, one finds obviously the current pope of the singularity Ray Kurzweil which anticipates this one around 2030-2014 as well as Mark Zuckerberg of Facebook which thinks that the man will be reasonable in his uses of AI. Only here, artificial intelligence is not a product. Nor is it a unified software like a word processor, a mobile application or even an operating system. There are no artificial intelligence software but the artificial intelligence solutions based on dozens of different bricks ranging from capture the senses, including audio and visual interpretation of information at language processing and the exploitation of large structured or unstructured databases. Their integration remains a DIY business. We are still in the Stone Age, with only about fifty years of hindsight on the issue. In line with other series of articles of clearing of complex technological subjects of this blog, I propose here to dissect what is known of the state of the art of Artificial Intelligence, its applications and progress being made. 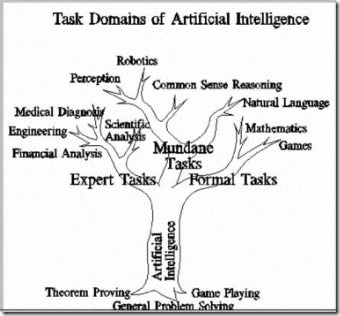 What are the major technological bricks of artificial intelligence? This is a little messy area that I will try to segment. What are the different uses of artificial intelligence ? I will resume the most common case studies and comment on them. How are artificial intelligence solutions marketed , taking the example of IBM Watson? In describing the approach that is currently dominant service for enterprise solutions, but with a strong development of mainstream applications in parallel. How is the artificial intelligence ecosystem developing , from large groups like Google, Facebook, Microsoft and IBM to start-ups in the sector? What are the industrial stakes in the sector? And the position of France? What is the role of open source? How bricks of artificial intelligence progress ? Is it related to the invention of new technical processes, the progress of equipment or both, and in what proportion? What could accelerate or slow this progress? As usual in many of the publications in this blog, this is the result of a personal quest on a new subject, relying heavily on extensive bibliographic research. I am not a specialist in this field and I learn on the water while sharing the result of this learning. This quest is published in 9 parts, and following the order of the questions above. Your feedbacks and suggestions are welcome, it is the advantage of writing a text in several parts! Artificial Intelligence brings together the sciences and technologies that make it possible to imitate, extend and / or increase human intelligence with machines. AI is part of what is also called cognitive science. IBM is integrating Watson into its offer of “cognitive computing”. I looked for how to segment it into domains. Roughly, we first find out about the senses and the ability of computers to read, see and hear, then structure their memory, learn, reason, and then make decisions or help make decisions. I then tried to segment the field of AI and very badly took me. Several divisions exist, at the conceptual level and then at the technical level. The Artificial Intelligence Narrow (ANI) corresponds to the problems of processing capacity in a specific field. This is the current state of the art. It started with the systems playing and winning at chess like IBM’s Deep Blue in 1997, then with advanced expert systems as in some health sectors. It can be bulk current search engines, the detection of bank fraud, the credit rating of individuals, automatic or assisted driving, Apple SIRI, Microsoft Cortana and Google Translate. If the AI ​​does not imitate the man for the moment, the brute force and the use of technical elements which the man does not have as the speed of treatment and the storage of big volumes of data allow already to the machine to overtake the man in a whole bunch of domains! And in other dimensions than those that make man man. On the other hand, are not part of the field of AI simple problems that can be solved with simple algorithms. This is the case of automatic flight control systems. The Artificial General Intelligence(AGI) corresponds to the level of intelligence equivalent to that of man, with a versatile side, with the ability to reason, analyze data and solve various problems. We can integrate in this level a large number of human capacities: the use of language both as transmitter and receiver, the use of sight and the other senses, memory and in particular associative memory, thought, judgment and decision-making, multi-faceted problem-solving, learning through reading or experience, creating concepts, perception of the world and of oneself, invention and creativity, ability to react to the unexpected in a complex physical and intellectual environment or the ability to anticipate. We can add the ability to feel personal emotions or feel that of others (empathy), have desires and desires and also know how to manage his impulses and act with more or less rationality. This list is very long! For the moment, we are still far from it, even if some of these capabilities, particularly linguistic and general reasoning, are emerging. AGI is dependent on both material progress and our ever-evolving understanding of the functioning of the human brain as part of the broad field of neurophysiology, spanning areas ranging from neurobiology (for “low” layers) to neuropsychology (for the “high” layers). The functioning of the brain appears as discoveries are much more complex and rich than imagined. Neurons would be able to store analog and not binary information, which would multiply the storage capacity by several orders of magnitude compared to what was believed until recently. We know, however, that the brain is both ultra-massively parallel with its trillions of synapses connecting the neurons to each other but very slow (“clock” of 100 Hz maximum). The Artificial Intelligence Super (ASI) is a logical extension of the previous step, related to power machines which multiplies and distributes itself more easily than that of a human brain with its input-output and storage capacities and limited treatment. At this level, the intelligence of the machine exceeds that of man in all areas including creativity and even social agility. The passing point is a “singularity”. It is mentioned in many books like the famous The Singularity is Near by Ray Kurzweil. It is also in this essay The Singularity – A philosophical analysis the Australian philosopher David J. Chalmers who proposes first to test the ASI in an entirely virtual environment completely disconnected from the real world to test his aptitudes. If that can reassure! In practice, today’s AI already goes well beyond human capabilities, especially when memory is at stake. The ability of expert systems, including IBM Watson, to brew huge volumes information provides capabilities inaccessible to any human, even gifted. ASI is therefore a mixture of genres between areas where man is already out of date and those where he is not yet and will become so. Seen from the side of optimism, the ASI would have an indirect impact: the immortality of the man, consequence of the discoveries generated by the ASI. This is obviously to ignore what can not yet be done entirely digitally. Progress in health is limited by the experimentation that is still done in-vivo and in-vitro. In-silico experimentation – in an entirely virtual and numerical way – of biological processes is a field in full development. For the moment, it faces obstacles close to the insurmountable, even integrating the wonders of exponential progress and Moore’s law. Scientific research in health is therefore always reduced to conducting iterative and rather slow experiments, even with the most modern equipment. With or without AI, this is immutable. Moreover, the best AI solutions such as the use of IBM Watson in oncology rely on the corpus from all these experiments. He has a physical and real base. We can certainly automate biological experimentation even more than today in the search for therapeutics, but it will always remain biological, not digital, so rather slow and not very scalable. 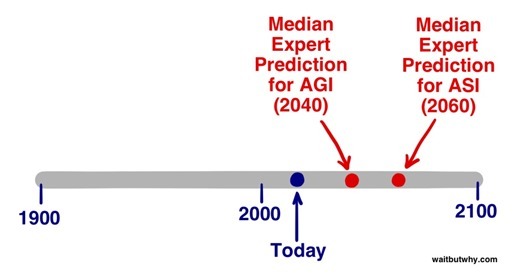 It would arrive at the stage of the AGI between 2030 and 2100 according to the forecasts, and of the UPS a few decades later. One wonders what would explain the delay between the two in view of the acceleration factor related to hardware. Let’s continue our quest for the definition of AI in an MIT course . 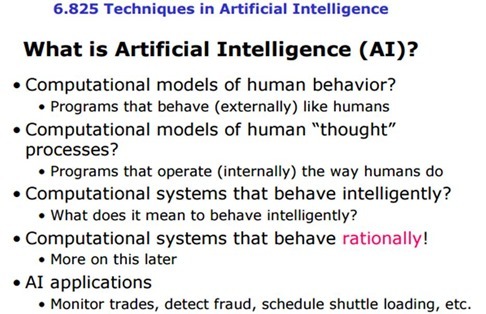 AI would be a set of techniques for imitating human behavior, acting rationally based on facts and data and able to achieve a goal. Rationality is not omniscience but the ability to act on the information available, including ambiguous ones. This rationality is usually limited by our will and our ability to optimize. Another division, finer, AI, in three areas: the symbolism that focuses on abstract thought, the connectionism that focuses on perception, including vision, recognition of forms and which is based in particular on artificial neural networks and finally, behavioralism which is interested in the subjective thoughts of perception. It is in this last area that can integrate affective computing ( computing emotional ), which is exploring ways to recognize, express, synthesize and model human emotions. This is an ability that IBM Watson is supposed to bring to the Aldebaran / Softbank Pepper robot. In particular, AI can be used to automate cognitive processes and is based on four steps: observation of facts and data, interpretation, evaluation and decision-making, with action or proposal of actions, often based on statistics. There is also talk of symbolic intelligence and computational intelligence . The first solves problems with knowledge (this is the current field of AI and machine learning), the second with data from examples and learning. The latter domain includes neural networks, fuzzy logic and genetic algorithms. 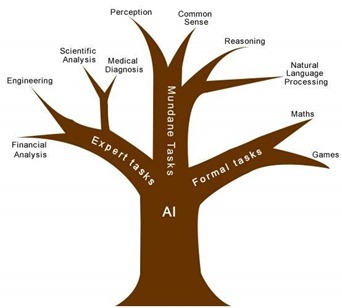 Here is another breakdown: that of the tree with three main branches: one for the tasks of expertise , the second for the current tasks(perception, common sense, reasoning, language) and the third for formal tasks ( mathematics, games). But that does not describe the associated technological bricks. This other cutting-edge, more down to earth, includes machine learning, language processing, expert systems, robotics and vision. The architecture is average: it would be more logical to group the senses with speech and vision. Not to mention the hearing that can also serve. When it comes to robotics, it aims to integrate all the other fields of the scheme and to add others that are specific to it, such as sensors, materials, mechanics, electric motors and batteries. 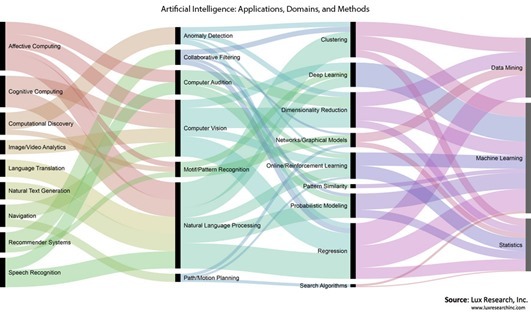 Finally, this last diagram makes a formal link between three groups: the applications (affective computing, image and video recognition, translation, …), the application domains (computer vision, NLP, …) and the methods (with three broad categories: data mining, machine learning and statistics). Well, but we can also do data mining through machine learning and it can also rely on statistics. All this is recursive! This is a good reminder that AI-based solutions are not “software” but the assembly of various software bricks as needed. And these bricks are most numerous. So much so that their integration is a technical issue and a major profession, perhaps the most complex to take up. Aymeric Poulain Maybant sent me his doctoral dissertation on hybridization in cognitive science that dates back to 2005 and describes this issue very well. Integrative AI is one of the main factors of development of the sector. It is found in the combination of many techniques in AI solutions such as the coupling of neural networks and statistical approaches, especially in speech recognition. If you asked an Artificial Intelligence system to self-define and self-segment by exploiting the available bibliographic data, it would be in bad shape! A bit like it is difficult to characterize a contemporary period, without the look of the historian of the future who can step back to analyze the present. Are you already lost? Me too ! In the next part , I will go into the lower layers of the AI ​​and inventory the main software tools that compose it.